Tea. I’d take that over a cup of coffee any day. My preference has a lot to do with my UK upbringing, where tea drinking is a quintessentially British tradition. So, I guess, in a way, it was my surroundings that dictated my inclination towards a ‘good old cup of cha’. The same can be said for Columbian boys John and Nestor too; only for them, it’s coffee every time. I mean, Columbia, coffee, it goes hand in hand. I meet John Mejia and Nestor Vasduez during a visit to Global Village (the quintessential Dubai experience), and their attire first catches my eye. Donned in little straw hats and buttoned up shirts, the image instantly brings back memories of the ‘man from del monte’. For those who aren’t familiar, he was a legendary character from a British television advertisement back in the nineties. It depicted a sharply dressed man in a buttoned-up shirt, white linen suit, and like John and Nestor, a little straw hat. Travelling to the furthest corners of the world — including Colombia — to select the greatest oranges for the brand’s popular fruit juices, he was smooth, he was suave, he was the ‘man from del monte’. To date, it’s become one of the most iconic ads to come out of the UK. I guess it was their hats that triggered that nostalgic throwback. Walking through the Americas Pavillion, I see a small gathering — maybe five or six people. It’s the busiest stall in the place. Curious, I walk over. Before clocking the coffee machine to the left, the aroma gives away what’s brewing. When the crowd starts dispersing, I spot two hats first and under them, two young guys in their early twenties. The image of South American baristas serving up coffee in the desert has an authentic charm; one that a trip to a coffee shop just doesn’t. It piques my interest; me, a tea girl! 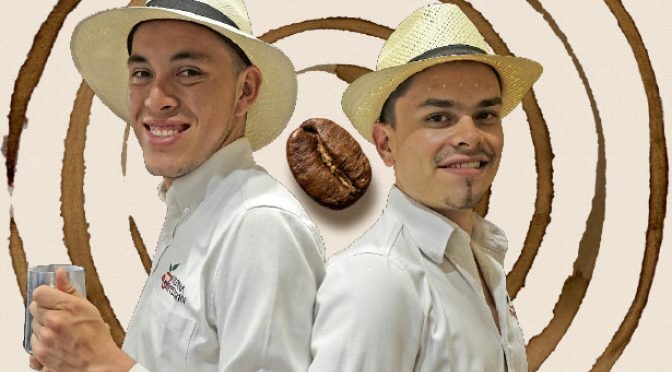 After a quick introduction and a not-so-subtle name drop that I’m a reporter for a local newspaper, their reaction leaves me with no choice but to write this very column; a column dedicated to John and Nestor and their love for all things coffee. With my notepad and pen in hand, the two exchange an energetic high five: “Yes, yes, we’re going to be famous.” And so our 10-minute chat begins. I find out the duo are in Dubai for their debut spot at Global Village. They landed in April and will fly out again next week. On their stall-top sits one small coffee machine and little else. Behind them, cardboard boxes tower, maybe 7feet high. I later find out they’re filled with packets of coffee beans. The kiosk is a stark contrast from the hipster coffee spots, which line nearly every corner of Dubai. You won’t find trendy beanbags or up-cycled book shelves here. What you will find is some of the best coffee around — or so I’m told by those queuing to hand over Dh10 for a shot of the “real stuff”. I didn’t try it; I regret that now. Intrigued to find out how the duo got into the business of coffee, I grab a few minutes with Nestor while John tends to the few still waiting to get their fix. For them this isn’t a business, it’s a love. Over the swooshing of the machine, John tells me he’s only been doing this for one year, but his method of brewing and pouring each cup would say otherwise. With the cup tilted, he pours the coffee from a height. He’s precise; his technique perfected. Nestor’s journey began six years ago. He was in his late teens and like most his age in Colombia, out of work. Penniless and bored, he would hang out on the streets with friends. Each day was Groundhog Day. Then a friend approached him with an “opportunity”. That opportunity was coffee. Offered a position as a barista, Nestor took it without hesitation. He knew nothing about the intricacies of coffee, but says it was his “lucky break”. Like all baristas in Colombia, Nestor spent months with the coffee farmers harvesting the finest Arabica beans from Colombia’s emerald hills. And in a country where mountains and volcanoes are in abundance, he says Colombia has a “magic climate for coffee”. He tells me the beans are harvested by the native people — there are around 40 native cultures in his country — and it was that experience, seeing the full process from start to finish, that kick-started his love for coffee. Everything is done by hand. The farmer picks the beans; the farmer washes the beans. As he holds up a single coffee bean and stares at it intensely, I quickly learn that turning those raw green beans into something “delectable” is an art form. And the secret is all in the roasting. I learn that it’s time and temperature that determines the level of roast from light to dark. And that, in turn, determines the taste. Heated for up to half an hour, most coffee drinkers have a preference when it comes to roast level. For Nestor, it’s medium; for John, the same. Espresso is the brew of choice for both too. “I always order an espresso. It’s the most intense, the most glamourous,” Nestor tells me. While John is just one-year into his barista journey — a journey picked by choice — I wonder where Nestor would be today if that opportunity didn’t take him from street to coffee stall six years ago. A 10-minute chat just isn’t enough to find out. But as I sit at my desk drinking Nescafe and powdered milk from a jar (my tea has run out! ), I again wonder: Would the Nestor then care so much about my poor coffee choices as the Nestor now would? I doubt it.